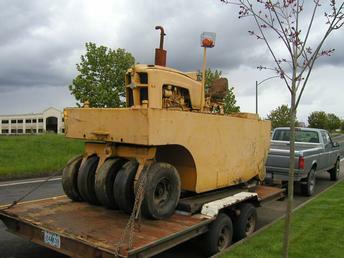 This roller is powered by a Minneapolis Moline Power Package 31, serial number 15100122. It's basically a 445 tractor minus the wheels set on top of the roller undercarriage. The undercarriage was manufactured by Flaherty Mfg. in Pocatello, ID. Roller SN# is 1A-109. Interesting features include no clutch and no ampli-torq, but rather a torque converter with a forward/reverse lever. I guess I'll use it to keep the driveway smooth? hehe. Does anyone have any additional info about this machine?